Well we're still in the park, with yet another sculpture by Anish Kapoor. Sheltering beneath the large red circle is an Egyptian goose looking across the lake. I hope the outlook for the Egyptians beneath the large red sun is as bright as it is for the goose. I will, perhaps, mark myself out as an art idiot - but it wouldn't be the same without the goose. I agree with Lucy ^. The goose makes the art! An interesting work and thoughtful words. Well – I like it, with or without the goose. 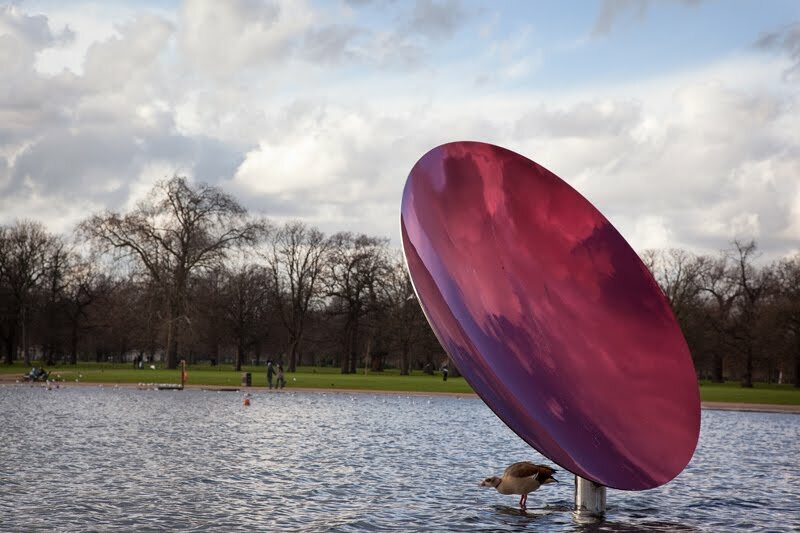 I have been liking the Kapoor pieces that you have shown us! Thanks. I wonder what inspired Mr. Kapoor for these installations. I have questions to his muse). I've still never manage to photograph that damn thing lol. I've got loads of snaps of the bigger mirrored one on the bank, but not that one! While I always enjoy a bit of goose, I think the reflected clouds in the dish make this great.